It’s more inviting, more festive, more beautiful. It doesn’t have to be expensive, fancy, or elaborate, just a few items can transform your Thanksgiving table, and the Thanksgiving feast you set upon it, into something beautiful. And have fun with it! I think a tablescape should reflect your personality. Hot Skwash Pumpkins – Rich, velvety pumpkins in warm hues with real pumpkin stems. Handcrafted in Oregon. 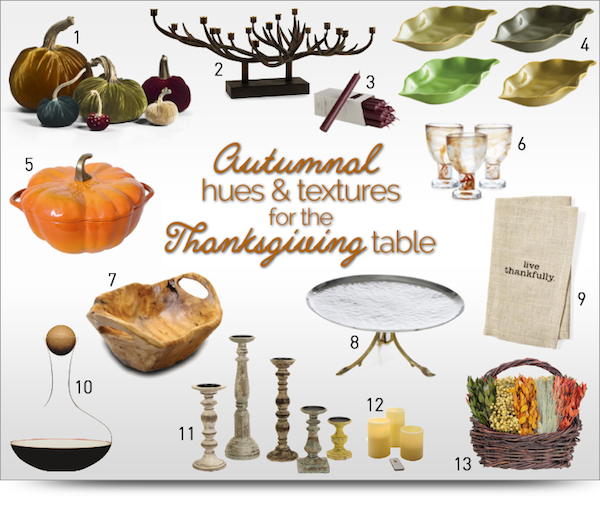 Centerpiece on the table, the buffet or adornment over the mantle. See them here. Branch iron candelabra – A rustic but elegant and certainly dramatic candelabra that holds 17 candles. Buy it here. Dripless pillar candles – A set of 12 dripless candles in a color to suit your decor. Save your furniture and table linens from dripping wax! Get them here. Leaf appetizer dishes – These glazed leaf dishes are the perfect size for each guest to use as appetizers or for the hostess to serve sauces, dips, olives… See them here. Pumpkin Dutch Oven – A perfect Oven-to-Table piece, and certainly one that is an ode to the season. By Staub. You’ll have it forever. Buy it here. Swirled tangerine glasses – These goblets boast of seasonal colors and style. See them here. Root wood bowl – This one-of-a-kind wooden bowl is crafted from reclaimed fir wood. It is food-safe and perfect to serve dry foods such as breads. Check it out. Footed leaf tray – Highlight your hors d’oeuvres and desserts on this elegant pedestal tray. Get it here. Live Thankfully napkins – A set of 6 natural cotton napkins that are very propos with the “Live Thankfully” inscription. Buy these napkins here. Wine carafe -Stylish wine serving is to be had with this hand-blown wine carafe with an oak wood stopper. Or use it for water or juice. See it here. Wood candle holders – A set of 5 wooden candle holders, each with a different distressed finish. Love them for the Thanksgiving table and anywhere in the house for the rest of the year. Get the set here. Flicker LED candles – Perfect for the wooden candle holders and you won’t have to worry about them. The natural flicker will make you forget these candles are battery operated. Oh, and remote control is pretty cool. Get them here. Autumn floral basket – Preserved sunflowers, myrtle in orange and green, flax and natural wheat make up this decorative harvest basket. Put it anywhere in your home to announce Thanksgiving. Buy it here. Give your guests an inkling of the festivities that await them inside by adorning your front door this absolutely gorgeous autumn foliage wreath. I love that Branch iron candelabra! I have those flicker candles, I LOVE them, they look so real! I’d love to get the natural napkins. love 1 and 2! i dont celebrate thanksgiving but my cousin is visiting from the US so i want him to feel at home and we are goin to celebrate it! You certainly know how to set a table. Very stylish! I love, love, love those napkins. I need to get some. 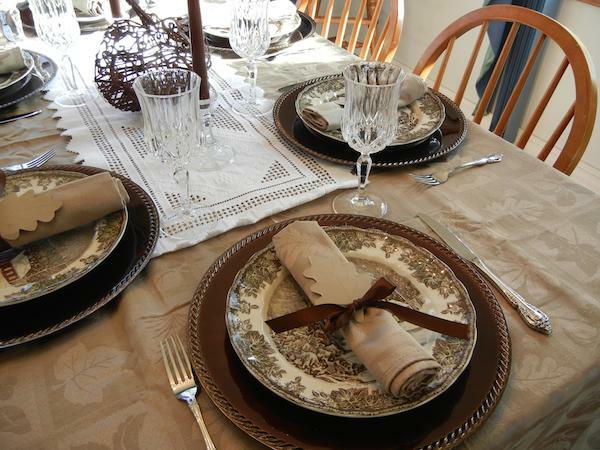 I agree–we decided to decorate the table for Thanksgiving for the first time last year and it felt so much more special. Definitely continuing on this year. That branch candelabra is gorgeous! I would love to use it throughout the holidays by adding different greenery around it.